The parents of a boy who locked him in a room "not fit for a human" have been found guilty of child cruelty charges. He was also banned from speaking at home and fed stale food by the pair, Northampton Crown Court heard. 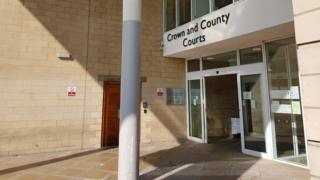 The parents, who cannot be named, were found guilty of five child cruelty charges each and will be sentenced on 28 May. The father was cleared of eight counts and the mother found not guilty of nine. Jurors heard how the boy was forced to defecate on the floor after being locked in a room. During the trial, a social worker described a meeting she had with the brother of the boy, who said the child was fed leftover food which was "sometimes days old". The boy was also beaten and made to sleep next to his brother on a filthy mattress with the springs sticking out, the court heard. The jury found the father guilty of hitting the boy and agreed that the mother failed to protect the boy from being hit. They also found them guilty of keeping him in a room contaminated with faeces and urine, not properly feeding him and two counts of providing the children with inadequate bedding. Det Con Nicola Langston, from Northamptonshire Police, said: "Some children have suffered significant harm and hopefully with this closure they will be able to recover and move forward with their lives."